When you have the word “Awesome” directly in your name, your game is going to come with certain expectations from the gaming populace. Luckily for Ronimo Games and Abstraction Games, who handled the PS4 port, Awesomenauts Assemble succeeds on almost every possible level and earns the namesake in its title. From gameplay to character design, the word “Awesome” oozes out of every conceivable pore on this refreshing take on the MOBA genre. Before we begin our review, lets highlight what exactly a MOBA is since many of our readers may be unfamiliar with the term or genre; after all, Awesomenauts is the first of its kind on the PlayStation 4. The term MOBA stands for “multiplayer online battle arena,” with the most commonly known example of the genre being League of Legends. It's a subset of the real-time strategy genre but without all the base building and the need to control multiple units, focusing instead on hero building and controlling only one unit. Matches in a MOBA game generally comprise small teams in direct opposition to one another, often needing to destroy the other team's base to win. All players start the game at level 1 and, by killing small enemies on the battlefield (known as “creeps”) along with other players, you will gain experience which you can use to level up your character and gain new abilities over the course of the game. Imagine like an RPG set to fast forward. MOBAs are generally split into phases: the first half of the game will be powering your character up as quick as possible and the last half will be attempting to destroy the player's base. You'll want to make sure to avoid death, more so than in any other game, because your death generally results in the other player's team getting experience. An inexperienced player is a huge hindrance in a MOBA because that player will just enable the opposition to power up that much faster. For this reason, MOBAs rely on a lot of teamwork and knowing your character inside and out, as each has their own strengths and weaknesses. In other multiplayer genres, strong players can “carry” weak ones, making up for their weaknesses. Not so in a MOBA, which is why the genre is prone to a very volatile community. Awesomenauts Assemble, while doing a few things different than your typical MOBA, shares a lot of similarities with other games in the genre. Matches are 3v3 affairs against other players, one team being red and one team being blue, with the primary objective in each map revolving around destroying the enemy's power core. However, that's not as easy as it sounds. To get to the enemy's power core, a handful of turrets (the number depends on the map) stand in your way. These turrets quickly turn your chosen Awesomenaut into something resembling swiss cheese, so how do you defeat them? By working together with the artificial intelligence. Each team releases small robots, called drones in-game, at regular intervals. While players can quickly destroy drones, turrets take a bit longer to destroy drones due to their anti-turret shield. Turrets focus on drones, letting you deal damage safely to a turret as long as the drone is still alive. The early game amounts to protecting these drones, destroying your opponent's drones and trying to destroy your opponents as well. A third enemy type consists of neutral creeps that can be destroyed for experience and health and generally reside in the middle of the map. There are usually two different paths to reach the enemy's core, so a decent amount of strategy comes into play. Does your team all pile onto one path and one turret? Do you split your resources between two paths and both turrets? Do you concentrate on leveling your characters first or do you rush straight for the kill? Do you roll the dice and hunt down other player's characters, or do you avoid them so your death doesn't help them? Awesomenauts is all about making these split-second decisions at all times during play. Your character, and the characters chosen by your allies, can play a huge difference in your strategy as well. Some characters are designated healers, others are offensive powerhouses. Some are close range fighters, some excel at long distances. Like all MOBAs, teams that use teamwork in Awesomenauts will quickly destroy those that don't. Combining Voltar's healing with Ayla's Rage makes an almost unstoppable team, for example. 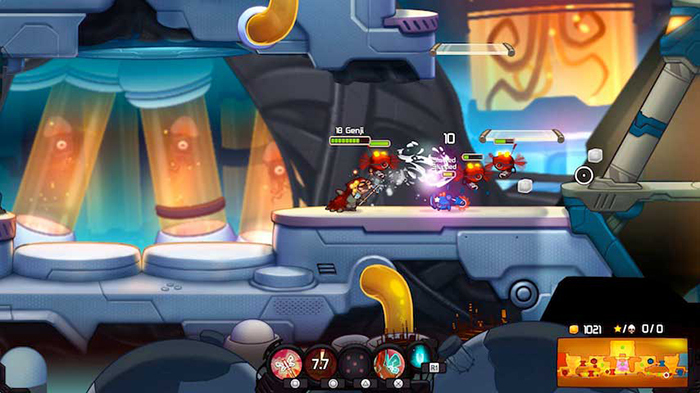 Awesomenauts features four well designed levels and 15 characters to play as, with each character being extremely different in playstyle while also being visually unique. Playing Ayla in the same way that you would play Clunk is just asking for disaster. 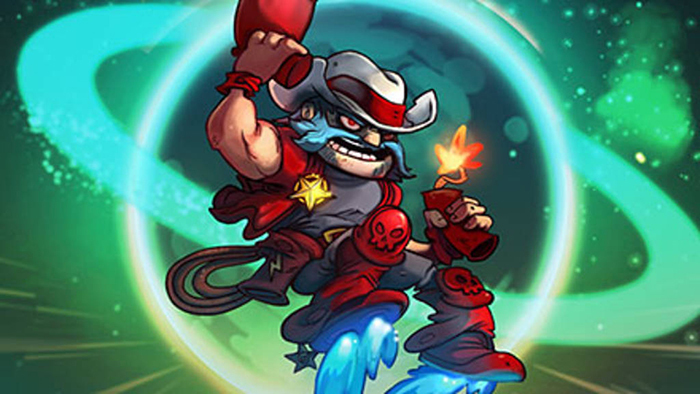 Despite some of the cries that “XYZ character is so overpowered,” every character in Awesomenauts has a counter. Once you really start digging deep into the game, you'll find a way out of almost every situation. Some characters are naturally stronger over others, but there is always a way to succeed as long as you use your brain and a bit of teamwork. It sounds like a lot to take in and believe me, as a newcomer to the MOBA genre, it was definitely overwhelming at first. Luckily, Awesomenauts includes a practice mode where you can play with AI Bots that feature five different levels of difficulty. The bots aren't the greatest players in the world, but they do a decent enough job and let you get a feel for your chosen character. Awesomenauts does include a tutorial, but this tutorial only explains the controls and not necessarily the finer details of the gameplay. The MOBA genre is one of the hardest for new players to come to grips with, so my recommendation is to get in a few rounds of practice after the tutorial before going online. 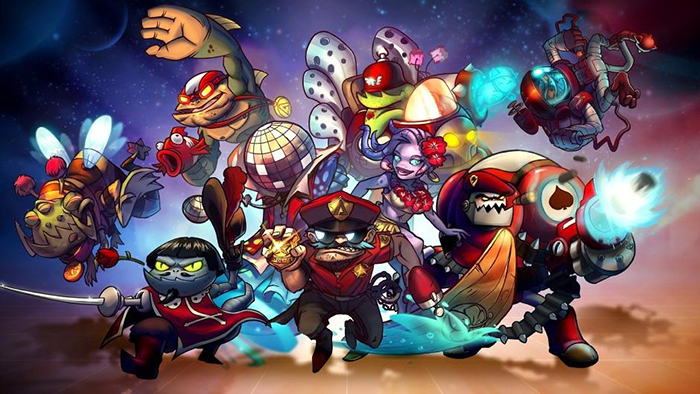 Awesomenauts Assemble differs from most MOBAs in one huge way: it's 2D. Similar to games like Rayman Legends or Super Mario Bros., Awesomenauts' gameplay is best described as being akin to a 2D platformer. The left analog stick controls movement while the right analog stick controls aiming. In an interview we conducted with Ronimo Games, the developer mentioned that Metal Slug had an influence on the game and it shows. If you've played Metal Slug, Contra or any similar game, you'll know what to expect here. If you've played other MOBAs in the past, having only two dimensions to work with in Awesomenauts will definitely change the way you plan your strategy, as you have less space to work with than your typical 3D environment. The 2D visuals are gorgeous, by the way; the artwork is bright and colorful, characters are animated smoothly and they have a large degree of animations available to them. The colors pop off the screen and while the action gets frantic at times, you'll never really be confused as to what is going on once you know how the game works. In Awesomenauts, every character has a basic attack and two special moves. During gameplay, leveling up your character will allow you to modify your special moves to do more damage, steal life, slow the enemy, etc. Where Awesomenauts differs from most MOBAs is the loadout screen, where you can customize any of the 15 characters to your liking. Awesomenauts Assemble uses an unlocking system similar to games like Call of Duty and Battlefield, but unlocks come at a very rapid pace. Within a few hours of playing I had unlocked all of the characters and all of the stages. The benefit of the unlocking system is that it let me try each new character as they were unlocked, instead of me just gravitating towards one and sticking with it. I never thought I'd find myself being a Yuri user, but thanks to the unlocking system I gave him a try while I waited to unlock some of the other characters and ended up loving him. Awesomenauts features over 109 ranks, so the unlocking system is fairly lengthy despite unlocks happening quickly. After rank 19 or so, you'll just be unlocking modifiers. Unfortunately for Admiral Swiggins fans, his unlocks are near the end of the spectrum. Luckily, the modifiers are not so overpowered that you feel you're at a disadvantage without them. Another great thing about Awesomenauts is that you're always playing. Sure, there is a wait of a few seconds when you die, but getting back into the match involves a mini-game where you direct your rocket into pockets of Solar: You're not just sitting there waiting to spawn like in other games. If you're just standing around in Awesomenauts doing nothing, you're playing the game wrong. In our recent interview with Ronimo, the studio mentioned that one of their inspirations was old 80s cartoons: It absolutely shows. From the very second you boot the game, you're treated to a theme song and cinematic trailer that wouldn't be out of place among the greatest cartoons of the 80s, such as Transformers, Centurions and Visionaries. As someone who grew up in the 80s, the most magical era of cartoons, Awesomenauts hits all the right notes when it comes to emulating this era of cartoons. This love of the 80s extends to the characters as well; not only does each one have a unique style of play, as mentioned earlier, each one is visually unique with their own unique personality. There's Froggy G, a pimp frog. Leon Chameleon, an alien with a mechanical arm, a lightsword and a passion for love. Vinnie and Spike, two characters that wouldn't be out of place in a 1920s gangster movie. Derpl, who pilots a giant walking desk. Each character has a well-written backstory that is rife with humor and really gives you a feel into who these characters are. I find myself wishing that Awesomenauts would get some sort of animated spinoff, as I'd love to see more of these characters. The game is almost worth playing just to experience the character design alone. Great writing, awesome voice acting, beautiful graphics: can Awesomenauts pull off great sound design as well? Absolutely it can. Each character has their own theme song that plays both during the loadout screen and when you go on a killing spree, and these theme songs are fantastic. The sound effects have a suitable level of oomph to them as well, something so few games can actually get right these days. If Awesomenauts stumbles in one area, it's in how it offers downloadable content, or DLC. DLC is currently comprised of only skins; outside of two or three skins, no additional skins are available in the game through regular unlocking. Purchasing skins wouldn't be a problem except with Awesomenauts, these skins are expensive. A skin for one character costs $2.50, with premium skins, skins that also add in a new voice pack, costing $4.99. One additional option is to buy a skin bundle that contains a variety of skins for $14.99. However, when DLC costs more than the base game (Awesomenauts retails for $9.99), in my opinion that's a bit of a problem. The skins are incredibly well made, so it's a shame that they cost so much because no one seems to be using them. In the close to 50 or so games I've played online since the game's launch not one person has been using any of the DLC skins. A better alternative in my mind would be pricing skins at 99 cents, premium skins at $2.49 and then the bundle at... let's say $7.50. I understand Ronimo Games had to price the DLC the way they did to keep parity with other versions, but it's a real shame because the DLC is priced out of impulse buy territory with this approach. For a game so reliant on online gameplay and playing with other players, how is the online infrastructure holding up? So far, so good! In my review copy, I've been able to get into online games quickly (generally in under five seconds), I've encountered zero lag and haven't had any glitches or bugs to speak of. One downside is that when players quit in the middle of the match, they are replaced by bots until another human player joins. Getting a bot in your team is like getting saddled with a huge handicap and is often the kiss of death for your team, but this isn't Ronimo Games' fault: People just need to not drop out in the middle of a match. Thanks to drop-in, drop-out multiplayer, it won't be long before another human joins your time though. Joining a game in the middle of a match will award you extra Solar that you can use to quickly get your character up to speed. As mentioned earlier, the MOBA genre is known for being a very toxic, rage-fueled environment and sadly, Awesomenauts is no exception. Screams of rage and hate will come through your headset on a regular basis, and the best thing to do is either a) mute everyone b) only play with friends or c) enable party chat so you don't have to hear it. Yes, teamwork is important, but Awesomenauts includes enough visual cues, along with preset messages, that any player with a modicum of intelligence will be able to contribute. Again, this isn't a fault of the developer, but more of a heads up to any potential players. Awesomenauts Assemble is the most complete Awesomenauts experience you can get on a home console, so while the game doesn't specifically make sure of any of the PlayStation 4's features it is still the best console version of the game yet. The game plays like a dream with the DualShock 4 and the twin analog sticks, almost like the game was designed with this controller in mind from the beginning. If you're a PC Awesomenauts veteran who was worried about how the game would translate to a controller, be assured that there is nothing to fear. For trophy hunters, the PlayStation 4 version of Awesomenauts features a wide range of trophies highlighting all aspects of the game and offering some interesting challenges. Most of the trophies can be completed in Practice mode and all trophies reference an 80s or 90s cartoon in some shape or form. However, in one weird twist, all the trophies in Awesomenauts Assemble are bronze. Not only is there no platinum trophy, there are no silver or gold trophies either. The MOBA genre is one of the most popular genres in gaming right now and with Awesomenauts Assemble, the genre is well-represented on the PlayStation 4. Whether you're a MOBA novice or a grizzled veteran, you're going to find a lot to love with this game. It has a steep learning curve, but stick with it and you'll find a rewarding, strategic game that has no equal on the PlayStation Store. Interested in learning more about Awesomenauts and the studio behind it, Ronimo Games? Check out our interview! A copy of this game was provided to PS4 Experts by Ronimo Games for review purposes.